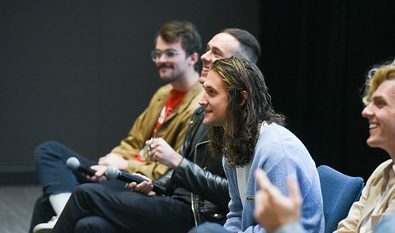 When Chase Lawrence (’14), a songwriting major, and Joe Memmel met in their music theory class, they didn’t know that fame was just around the corner. Now joined by drummer Ryan Winnen and bassist Zachary Dyke (’14), an audio engineering major, their band COIN has sold out arenas and broken onto the Billboard Alternative Songs chart. The band recently returned to Belmont to share their success story and advice to aspiring Belmont artists. After releasing a few singles on Noise Trade and playing small gigs, Lawrence said, “one show kept leading to another.” Their third performance as COIN was Belmont’s Rock Showcase, where the group was discovered by Columbia Records. Record labels will only “magnify what we bring to the table,” according to Lawrence. They will help you, but you have to put in the up-front work. Winnen emphasized that there is “strength in identity.” Your music has to be a reflection of the culture of your band, and you must be authentic to that culture. Most importantly, the group attributes most of its success to “just showing up and trying,” said Memmel. He pointed out that you can’t be too shy to share your music.